Chair Mat for Carpets | Low / Medium Pile Computer Chair Floor Protector for Office and Home | Opaque, Studded | Polypropylene | 30"x48"
Chair mats made from long-life polypropylene protect your floor and prevent from everyday wear and tear caused by office chair casters, for effective floor protection at a fraction of the cost. 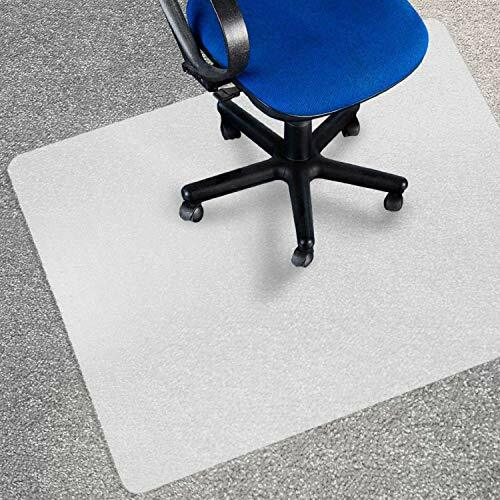 With the users needs in mind, these mats are ergonomically designed to allow for effortless movement of office chair castors (wheels), in turn helping reduce stress in the workplace and also reducing leg and muscle fatigue. A non-slip backing provides complete stability and holds the mat firmly in place while in use. Office Marshal® polypropylene chair mats have an opaque/frosted finish and are not completely transparent. If you are interested in a transparent chair mat we advise that you consider taking a look at one of our Office Marshal® polycarbonate chair mats. Office Marshal® chair mats are available in a wide range of sizes and can be used to cater to any need. To select your size, please refer to the size options located at the top of the page. EFFORLESS ROLL, STABLE GRIP: The unique surface texture allows your office chair to move easily while carrying out daily tasks, but has enough grip to maintain controlled rolling so the chair doesn't skid around. Ease of rolling between tasks promotes ergonomic posture and helps to considerably reduce the risk of leg fatigue. BUY WITH CONFIDENCE: Office Marshal® are dedicated to providing premium quality products for your home and office without the heavy price tag charged by many of our competitors. Experts in ergonomic chair mats, our vigorously tested product range is sure to meet all of your needs. For more options please see our wide range of polycarbonate, PVC, polypropylene, Eco-Series and fun coloured chair mats. Beautiful Black Rectangle Chair Mat for carpeted surfaces, Straight Edges, rounded corners, size 60" W X 96"